Our team has developed a technique to refine silicon to solar grade threads by melt drawing silicon powder within glass cladding. The main advantage of the technique is that it reduces manufacturing costs by 50%. The silicon threads are mono crystalline silicon with the potential to reach efficiency of 23%. 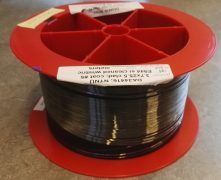 In addition, the silicon threads are flexible to a diameter of 5mm, and compatible with a variety of substrates appropriate for different applications including building facades, carbon composites of cars and trains. By making solar energy more affordable and desirable for customers, we aim to decrease the share of fossil fuels in energy consumption. The fabrication technology of this product is another ‘green’ aspect. The conventional silicon refining reactors are costly and sawing ingots to wafers wastes about half the material. While the silicon dust can be recycled, the energy used to form that portion of the ingot is lost. The alternative semiconductor materials contain toxic elements and are not suitable for a wide range of uses.